ABOVE: An HSB coal-burning steam locomotive from the early 1950s in the Drei-Annen-Hohne railroad station. INSET BELOW: A passenger car in the Brocken summit station on a snowy March day. The HSB, a.k.a. the Harzer Schmalspurbahnen, is the largest narrow-gauge railway network in Germany, with 140.4 km (88 miles) of meter-gauge track serving an estimated 1.1 million passengers each year. The company, which is based in the pretty town of Wernigerode in Sachsen-Anhalt, serves towns and villages on the eastern slope of the Harz Mountains with a fleet of 25 coal-burning locomotives, eight diesel engines, and 10 self-powered trainsets. Don't let those coal-fired Dampflokomotiven deceive you: The HSB is a working railroad that carries shoppers, commuters, and schoolchildren, not just tourists on excursions. Its trains run 365 days a year, even on the scenic Brockenbahn route that's featured in this article. The 19-km/12-mile line carries tourists, hikers, and picnickers from Wernigerode to the former East German State Security listening post on the summit of the Brocken, the highest mountain in Northern Germany and the centerpiece of Harz National Park. 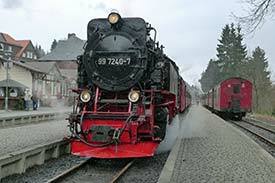 The HSB also links up with the Deutsche Bahn (Germany's national railway) in three towns--Wernigerode, Quedlinburg, and Nordhausen Nord--making it possible to reach the Brocken and villages in the region by train from Berlin, Leipzig, and other major cities throughout Germany. On the next two pages, you'll find information on traveling with the HSB (including Web links) along with a series of captioned photos that show what it's like to take a steam-powered HSB train from the Harz foothills to the Brocken in summer or winter. When you've finished this article, be sure to see our articles on Wernigerode and the Brocken, which will help you plan a trip to a region that once was part of the "Green Border" between East and West Germany.